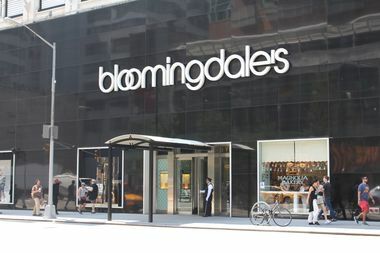 Bloomingdale's at 1000 Third Ave., at East 59th Street. UPPER EAST SIDE — Four Queens residents were caught trying to purchase more than $42,000 in designer handbags from Bloomingdale's with stolen credit cards on the same day, according to the NYPD. In the first incident, two women, Zihong Yuan, 22 and Ting Ting Zhao, 21, and a male teen walked into the department store at 1000 Third Ave., at 59th Street, on Thursday just after 3 p.m. and grabbed nine Chanel handbags worth a total of $36,315, authorities said said. All three of them tried using stolen credit cards to buy the bags but were busted at checkout, police said. During a search, Zhao was also found with a controlled substance in glassine envelopes inside her purse, authorities said. All three were charged with grand larceny, identity theft and criminal possession of stolen property, and Zhao was additionally charged with criminal drug possession, police said. About an hour later, another Queens woman whom police said was unrelated to the trio tried using a fake credit card to buy two Chanel bags valued at $6,400, police said. Liangyu Zhu, 42, was charged with grand larceny, six counts of possession of a forged instrument and criminal possession of stolen property, authorities said. ► A shoplifter threatened a convenience store worker with a scissors and bit a drugstore employee while stealing Red Bull and other items in two separate incidents this spring, authorities said. Joshua Smith, 21, of Lower Manhattan, was arrested last week following the April 27 robbery at a 7-Eleven and the May 7 robbery at a CVS, police said. In the first incident, he walked into the 7-Eleven at Third Avenue and 82nd Street around 2:30 a.m. and put 16 cans of Red Bull into his bag, police said. When an employee confronted him, Smith showed him a pair of scissors and said, "Don't come near me. I'll smash you in the face with the scissors," according to a criminal complaint. He then fled the scene. In the second robbery, Smith went into the CVS at 1172 Third Ave., near 68th Street, around 6:45 a.m. and grabbed 21 packages of Trident bubble gum, 20 Monster energy drinks and 20 Red Bull energy drinks before trying leaving the store, police said. Employees followed and tried to stop him, when a 31-year-old man working on the corner stepped in to help, police said. Smith bit the 31-year-old on the hand and they both fell to the ground, where Smith hit him the man on the right side of his face. The victim suffered cuts to his hand and face, and Smith ran south on Third Avenue, police said. Detectives eventually tracked Smith down and arrested him at the 19th Precinct on June 27, police said. At his arraignment, he was charged with robbery, petit larceny and possession of stolen property, court records show. The judge set his bail at $10,000 cash or $20,000 bond. His attorney did not immediately return a call for comment.